With the cold fall air comes the delicious opportunity to use pumpkins in your recipes again (since it's in season). 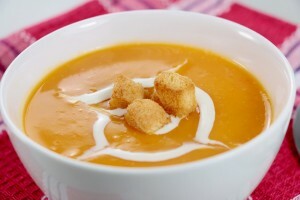 That's why this post want to take advantage of this and share with you a scrumptious pumpkin soup that can keep you warm during these chillier autumnal days. Dice and chop the ingredients that require dicing and chopping: the garlic clove, the parsley, and the onions. Use the olive oil on a large saucepan to keep the ingredients from sticking to it. Once you've oiled the pan, add the stock, the pumpkin puree, the garlic, salt, and pepper. Take the pan to the stove and let the ingredients in it boil. After the mixture boils, lower the flame and leave the pan be for about 30 minutes. Remember to stir, stir, stir. When the time has passed, little by little blend the mixture in a blender to make it softer and denser. This would also be the occasion to taste your concoction and decide if needs more flavor. If it does, add it now. The soup is now homogeneously blended, which means it needs to go back to the stove. Increase the heat to make it boil again. Just as before, once the soup has boiled, lower the flame and wait 30 minutes. In the meantime, add the double cream in with the rest and mix it up. Don't stop stirring to prevent it from sticking to the pan! Finally, you just need to serve the soup, add the parsley, and accompany the whole thing with whole grain toast or croutons! Make Your Soup Better with Bread from the Best Bakery in Austin! You can elevate your meal's taste by using the freshest, tastiest, most nutritious whole grain bread around, bread from Great Harvest in Austin. Call (512) 329-9216 to ask about their menu, or simply drop by the best bakery in Austin to have a taste for yourself.